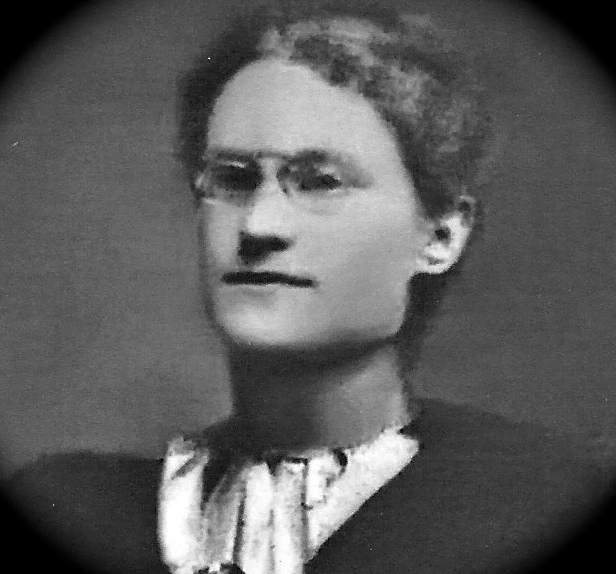 Agnes Theresa 'J' Ferriter was the twelfth child born to Nicholas and Mary Ann (Sullivan) Ferriter, Irish immigrants to America from the Dingle Peninsula area in Ireland. Agnes was born when the family was living in Barclay Village, Bradford County, Pennsylvania. Her father, Nicholas, and some of her brothers were working in the coal mines. The family had moved around since their immigration looking for better jobs over the years. Four of the twelve children born to Nicholas and Mary had not survived early childhood. But, by this time, there were a number of young working adults in the family. Her family eventually moved back to Richmond, Virginia, where they had settled for a few years until the Civil War broke out. Sometime between the age of 6 and 13, Agnes started attending St. Joseph's Academy in downtown Richmond. This school, run by the Daughter's of Charity, had been started in 1834 in order to provide a school for orphans and also for anyone else who needed a good education. Many of Richmond's finest families sent their children to this school. It continues to educate children but it has changed over the years and is now located north of Richmond and is called St. Joseph's Villa. But, given the mission of this school, there can be no doubt that this kind of environment instilled a sense of charity and fairness that stayed with Agnes throughout her lifetime. She later studied at the Richmond School of Social Work and Public Health (now a part of Virginia Commonwealth University) and also took some coursework at William and Mary College. In addition to studying for social work, she learned to be a stenographer. At home with her parents, Irish was still spoken-- so there is no doubt she was bilingual as well. In the 1900 census, she is living in the same household with her sister, Annie and Annie's family at 1210 West Cary St. in Richmond, VA. Annie had married James Finegan and they had three children in the home at the time. Also living there are Agnes' and Annie's parents, Nicholas and Mary Ann Ferriter. Agnes was working as a stenographer at a broker's business. In the 1910 census, Agnes is shown as living with her mother and father, but this time these three are living with a different sister and her family. They are sharing a home with Kate Ferriter Felthaus and her seven children at 218 Temple St, in Richmond, Va. Kate had married Gerhard William Felthaus but had become a widow by this time. Two of Kate's children are young adults and are working. One son is working in a tobacco factory and one daughter is working as a stenographer in a broker's office --like Agnes and possibly with Agnes. Immediately next door is another of Agnes' sisters, Johannah, who is also a widow at this time. She had married James H. McDonnell but he had died in 1898. All six of Johannah's children are shown as working at this time, as they are all in their twenties or nearly so. They were listed as having these occupations: saleslady, bridge builder, brick layer, etc. Agnes' father, Nicholas is working (as he had been for years) as an iron moulder at Tredegar Iron Works. On the other side of where Agnes is living, her brother Mike and his wife, Mary, are living. Mike is working as a shipping clerk in a Railway office in 1910. Nicholas died in 1916 and Mary Ann died in 1918. Soon after that, Agnes moved away. She went first to Hyattsville, Maryland where she had gotten a job as a policewoman. Back then, the title included one's gender as female police officers were quite rare. From there, she went to Washington, DC, where she was employed by the Bureau of Police in some capacity. On March 16, 1923, she started her job as a Policewoman in Lancaster, PA. She was the first policewoman in Pennsylvania history. It was in this job where she found her purpose. When she started the job, there was no job description beyond being advised that she was to work with woman and juveniles. There was no handbook. No guidelines whatsoever. She focused on special programs for juveniles and women as she had been instructed. Her obituary touted her ability to win over the men in the department by her effectiveness and her willingness to do whatever it took to accomplish a goal. She had a strong belief in prevention and she implemented a number of programs and goals that were seen through before she retired 23 years later at the age of 70. When she retired, she returned to Richmond, Virginia. She initiated the Agnes T. Ferriter Easter Basket Fund. Starting in 1930 up until WW II, needy children were given Easter Baskets and rabbits for Easter (yes--rabbits were given out in order to start small businesses apparently). She collaborated with 2 other policewomen in preparing a police training handbook for women which served as a model throughout the country. She was active in helping to establish a shelter for juvenile female offenders and in setting up a guidance counselor program. She served on the Virginia Advisory Board that helped place delinquent girls in temporary homes. She served on the Parole Board. She was an active in fundraising efforts for cancer research and assistance for cancer victims. She worked with the Girl Scout Program for many years. She served (in 1908 while living in Virginia) as the President of the Auxiliary of the Ancient Order of Hibernians of Virginia. Agnes never married and never had children of her own. She obviously cared for a number of children during a time when there were few resources available to help redirect young offenders. Agnes became that resource. She lived another twelve years after retiring. She spent the last five months of her life in ill health. She died on Feb 22, 1958, at the home of her neice, Lenora Cecilia Felthaus Massei. Her funeral was held at her much loved church, St. Elizabeth's Catholic Church in Richmond. One need only go to that church's website now to see that there was and is something special about this church. Agnes was buried in the large Ferriter Family plot (lot 245, section 7) at Mt. Calvary Cemetery, also in Richmond, VA. We honor her life by this memoir and by how we live our lives. I am glad to have gotten to know her a bit by having researched the life she lived. 1) Personal stories told to me by Leo Massei. Leo knew Agnes as she lived for a time at his parent's home. 4) Obituary and a feature article about Agnes T. Ferriter's life and death published in a Lancaster, Pennsylvania, newspaper on Feb. 23 and 24, 1958. (I only received a copy of a clipping without any identification of the particular newspaper this was published in). Further work to be done, but I have a copy of the actual article. 6) Grave plot diagram for the main Ferriter family graveplot (obtained by Gary Lester from the Library of Virginia). 8) The Family Bible (which had belonged to Nicholas) now in possession of Joe Massei.